The influences that distinguish New York’s approach to Shale Gas from Pennsylvania’s were again on full display this week in Albany. I visited the Capitol on Tuesday, the day that New Yorker’s Against Fracking held a rally on the Million Dollar Stair Case, the structure rising through the soaring arches, pillars, and buttresses of the Capitol building. With the rally leaders directing action to the protesters clustered in the open space on and between the landings and adjoining hallways, the protest could be felt and heard on several floors at once. The chants and cheers echoed through the chambers, forcing several staffers to close the doors of nearby offices of both Assembly and Senate quarters. 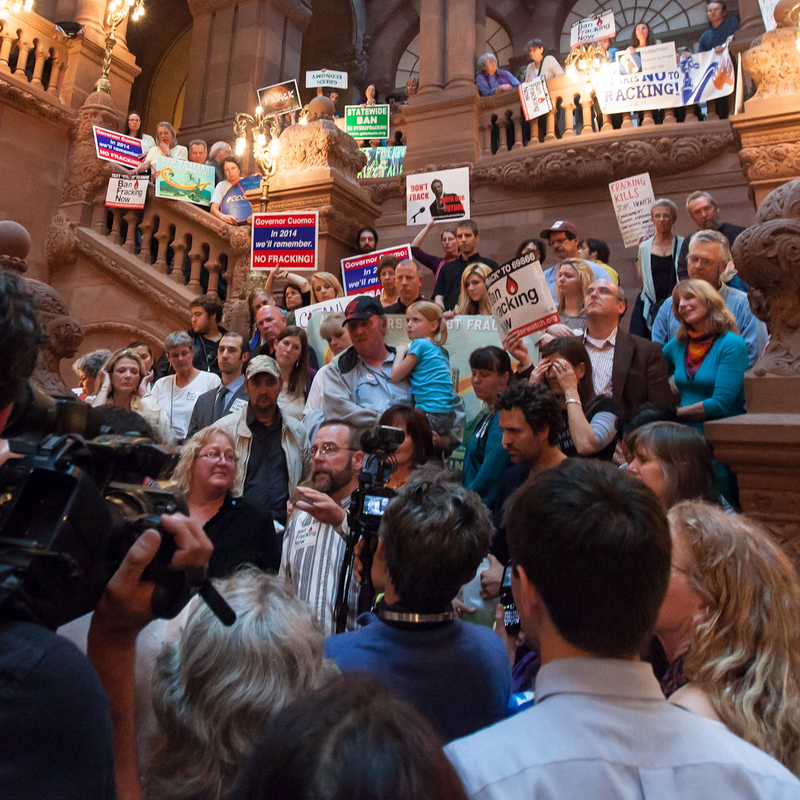 Rallies are not uncommon in Albany of course – and both those against and for hydraulic fracturing have been working to make their voices heard here. But the spirit of this rally was especially intense, and so was the star power. It was, in effect, a prelude for the day’s main event – a three-hour performance at The Egg featuring a host of New York celebrities railing against fracking. They included Natalie Merchant, Joan Osborne, Mark Ruffalo, Melissa Leo, among other actors, authors, and public figures working with a coalition of groups seeking a permanent ban on shale gas development in New York. Part concert, part rally, part speech making, it reminded me of events iconic of the No Nukes movement of the 1980s, lead by a host of celebrities contributing hugely to public disfavor of nuclear power. Frackers proponents rally, too, of course, and they are also engaged on battles on other fronts. Industry groups like Energy In Depth are attacking the credibility of high profile activists, like Julie and Craig Sautner, who have been among the most visible residents of Dimock, Pa., trying to hold Cabot Oil & Gas accountable for pollution of water wells in the Carter Road area. There are companies like Chevron, who are battling public perception with full-page adds in the New Yorker Magazine touting the social consciousness and morality of drilling companies. And some farmers and landowners – mostly from the drilling fairway in Broome and Tioga Counties -- have gone to Albany themselves to rally in favor or shale gas development, which they portray as nothing short of economic salvation. Still, when it comes down gauging the reach of grass roots activism, landowners in Broome, Tioga and other parts of the Marcellus and Utica drilling fairway desirous of leases tend to be outnumbered by activists who don’t want to see their state become like Pennsylvania or Texas, with long and mixed legacies of mineral extraction. Both Pennsylvania and Texas have readily welcomed the industry’s push to exploit shale reserves with the controversial practice of fracking, and Pennsylvania governor Tom Corbett has campaigned to minimize regulations and taxes on the industry. And while the future of fracking will not be left to referendum, it’s an issue that might effectively be determined in the next general election. Rally goers in Albany were calling for an outright ban in New York, like the one recently enacted in Vermont. There is no chance of that happening with this legislature session, even if it didn’t end next week. My sources in Albany tell me there is little expectation that the DEC will begin permitting shale gas wells in coming months due to the amount of work the agency has left to finalize its environmental review through the Supplemental Generic Environmental Impact Statement (SGIES). Beyond that, any legislative action now on the table to ban or further delay permitting pending review of the health impacts would depend on the outcome of the DEC’s pending environmental review. When that comes – and don’t be surprised if it’s after elections -- legislative legal battles will quickly intensify. If the issue were to come before lawmakers tomorrow, however, the Democrat lead Assembly would likely have the votes for a moratorium. But the measure would be hard pressed to pass in the Senate. That’s because Deputy Majority Leader Tom Libous, a Republican who represents landowners in Broome County desirous of gas leases, and Libous’s many political allies, would present formidable hurdles. The only way this would change is if Democrats gained control of both chambers. The other factor, of course, is Andrew Cuomo, who has proven to be a powerful and popular governor who could break the gridlock if he got behind one side or the other. (The governor was the main target of the anti-fracking rally.) So far, Cuomo has publically deferred to the DEC, lead by Joe Martens, a land-preservationist who appears in no hurry to rush the process along. The political winds could quickly change, of course, if the price of natural gas rises, along with the corresponding money staked to development. In the meantime, events like Tuesday’s concert continue to raise the profile and position of anti-frackers another notch coming into the meat of the election year. And they continue to raise money for their cause – Concert tickets to the 1,000-seat venue sold for between $40 and $150. Anti-frackers will need it to keep the fight close. They are up against an opponent with deep pockets and a long history of know-how to get things done both in Albany and Washington.